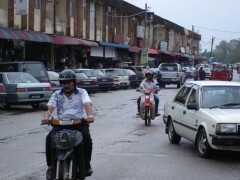 The town of Rantau Panjang can be found in the Kelantan province, in Malaysia. This is a big border crossing which is between Thailand and Malaysia and it’s located on Malaysia’s East Coast. There is a corresponding town on the other part of Golok River and it’s called Sungai Kolok and it’s the other part of the border. One of the things to do in this town is shopping, since there is an area with duty-free shopping which offers clothing, cigarettes and electronics. Getting to Rantau Panjang by road means coming from Kota Bharu, which is just 40km away. If you’re going between these two towns you will go through the Pasir Mas town. As for the border town of Rantau Panjang and the Thai town of Sungai Kolok, these two are connected by the Harmony Bridge. If you’re looking to get here by bus you can take the No 29 bus from the SKMK company, which goes from the province’s capital, Kota Bharu, to Rantau Panjang. The bus ride between these two towns takes around sixty minutes. If you’re looking for a bus from Thailand, there are none that pass the border. If you prefer taking the taxi, you got the option of getting a shared taxi, which runs between Kota Bharu and Rantau Panjang, though there are also a number of other destinations which can be reached by this method. You should talk about the price of the ride before you get inside the taxi. You can’t go into Thailand with them, so you will have to look for another method of transportation if that’s your target. Another option at your disposal is reaching the town of Rantau Panjang by train. Unfortunately you can’t go all the way with the train, since the passenger trains stop at the town of Pasir Mas. From there you can take either a taxi or a bus to reach the town of Rantau Panjang. If you’re coming from Thailand, you can use the bridge which connects the towns of Sungai Kolok and Rantau Panjang. You can get across the border by walking if you don’t have another type of transport at your disposal. If you’re already in the town, you can move around on foot, since it’s quite small. You can find the bus station in the vicinity of the immigration complex near the border. The town is not very busy or particularly interesting, but if you don’t have anything else to do you can look at the border and all the people that go through it.